The following instructions are used to make a connection from Dremio to Tableau and open a specific dataset in Tableau. In the Dremio UI, click on the dataset that you want to work with. From the dataset&apos;s Action dropdown menu, select Analyze With > Tableau. This action downloads a file. Click on the file that just downloaded and enter your Dremio credentials. [success] Your virtual dataset is now viewable in Tableau. 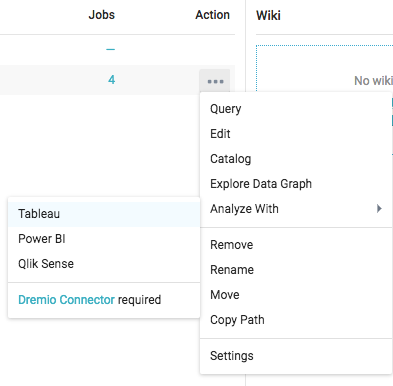 The following instructions are used to make a connection from Tableau to Dremio. Open the Tableau Desktop, select Add Connection. Select Other Databases (ODBC) as the connection type for a new connection. Dremio DSN the you configured on your system. Cluster details along with your credentials. Hit enter in the text field of the next screen&apos;s Schema dropdown to see what&apos;s available to explore on your cluster. [success] Your Dremio datasets are now accessible from within Tableau.